Living by the "treat yo'self" mentality, I always make sure to order myself lots of goodies each time payday comes around. This month's spoils were in the form of a lovely LUSH haul, which included the newly-released Honey gift box. Strangely enough, I actually hate honey. I can vaguely remember my grandpa giving me a spoonful of honey when I was younger to cure a cold, and immediately being sick. 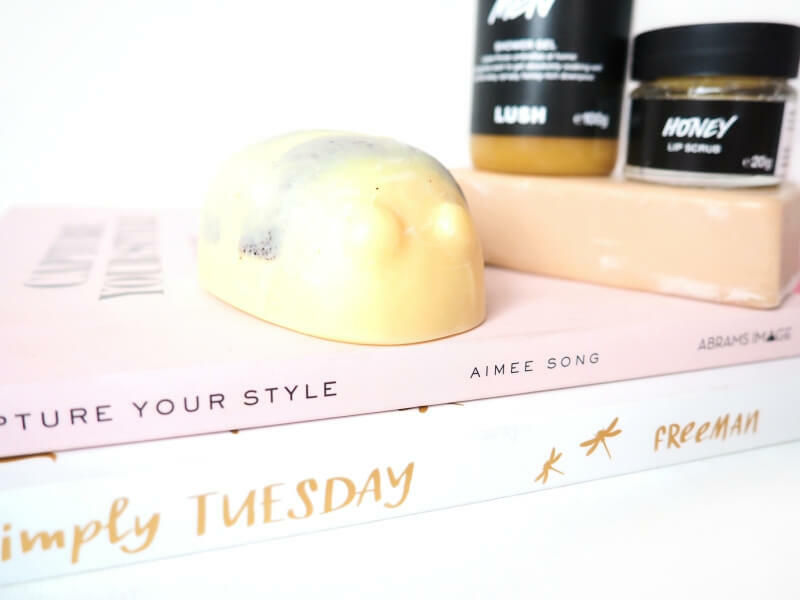 I haven't had it since, but after playing with the Scrubee body butter at the Mother's Day launch event and adoring the sweet scent of it, I added the Honey gift box to my basket when I spotted it online this payday. Another reason I actually chose the Honey gift box was for the Honey I Washed The Kids soap it contained. I've broken out really badly on my chin recently and as honey is a natural antiseptic, I felt it would be perfect to clear my skin up a little. Plus the honeycomb pattern is super cute, but more on that later on. Onto the actual review, I just have to talk about the gorgeous packaging. The outer box has a shell pink lid embossed with a gold foil bee and a peach interior, with a gold foil honeycomb print exterior to match. I will definitely be keeping (ha, bee keeping, so punny) the hexagonal shaped gift box to keep trinkets in after I've used the contents up. So... What's in the box itself? Holy hell, this soap smells incredible. A creamy, caramel and honey scent which lingers daintily on the skin after use. It lathers really creamily and the natural antiseptic in the soap has cleared my skin up a treat. They made it a permanent product! Scrubee first came out with the Mother's Day range and sold out far too quickly for me to buy it at the time, never to be seen again. Sike. LUSH have now made this beauty little body butter a permanent addition to their range of solid body butters, and I'm so happy it was included in this lovely gift box. I took Scrubee on holiday with me and it was absolutely amazing on my sunburn! It feels a little greasier than a butter, more of a solid lotion, and smells incredible. This is going to sound so strange, but the sweet, warm smell reminds me of our two guinea pigs. I feel so dim writing that, but it smells like fluffy fur and hay, it's lovely! My third ever lip scrub (I also own Bubblegum & Chocolate) and I think this may be my favourite of the three. When first applied it is overwhelming honey flavoured, which I *almost* don't like, but then it instantly becomes a sweet mint taste. This gift box retails for £24.95 and is available online, and in store. It's overall a lovely selection of four products I wouldn't have ever thought to buy separately, and it's so nice to be introduced to some new scents. What product would you like to see a full review on? Ooooh these sound lovely! I'm not a huge fan of honey either (although it works great with lemon when you have a cold/cough). I just love how Lush come up with the names for their products and it's probably the reason why I buy so much of their stuff. The soap sounds incredible - I love it when soap lathers up nicely on the skin! How did the shower gel feel on your hair? I've been dying to try out more of their hair products but I'm always wary about how it'll react. I really want the bee!! Every time I go in I pick one up, I need to just buy one soon, they look fab! I never knew honey helped to clear up breakouts --now I'm dying to try that soap as well! And since honey is one of my favorite scents, I bet I'd love it. Glad you were able to pick up the scrub at last, too! Ohhh this is the cutest set! Like you I'm not a huge honey fan and I actually didn't like the lip scrub when I tried it. I love the little scrubbee though! Need to get my hands on one of those! Gorgeous honey collection! I would love to try the body butter, sounds promising to me. Love your photos by the way! There's something about LUSH that's perfect when you want to pamper yourself. Can we stop for a minute and appreciate that packaging?! It's like an art! From the products I would love to try that body butter since I believe it would do wonders with my skin, and that lip scrub since I hate when I put lipstick and my lips aren't smooth. I always love going into lush and trying new things out, the lip scrubs have to be one of my favorites! I love the bubblegum one. Ugrh, I don't like honey neither :D haha, but these products look so good :O <3. You did an amazing job with review. Its looks really great product and I smell already the fragrance. I love honey and I normally bought also some beauty product with honey taste. I need to try out the lush gift boxes!! I've always been such a big fan of lush- but I've never done the whole gift box thing! I don't like honey either, I use it rarely purely because it's really good when you have a cold so I put a little bit of it in my tea instead of the sugar. These products look amazing and I think that buying a gift box is the best idea because I don't think it's very expensive and you get to try various new products.